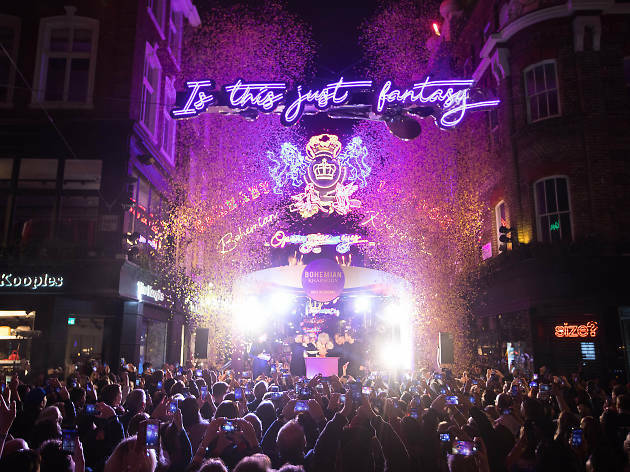 Christmas has come early for Queen fans thanks to the release of ‘Bohemian Rhapsody’ and the unveiling of Carnaby Street’s annual festive light display yesterday evening. Lyrics from the six-minute masterpiece, reimagined in neon and hoisted high above the famous shopping street to celebrate the release of the film charting the band’s career, were switched on by band members Brian May and Roger Taylor alongside cast members from the film including Rami Malek, Lucy Boynton, and Gwilym Lee. Doubling up as the Carnaby Street Christmas lights, the Queen-themed fluorescents follow last year’s carnival themed offering packed with parrots, giant party poppers and neon flamingos. The lights will be shining over Carnaby Street until early January 2019 and there’s also a ‘Bohemian Rhapsody’ pop-up shop where you can pick up Queen-inspired products for your Freddie Mercury-loving relatives. Is this the real life? Is this just fantasy? Get ready to travel up one of Battersea Power Station’s iconic chimneys in a huge glass lift. Open your eyes, look up to the skies and see an igloo on a London rooftop this Christmas.